Highly appreciate the great minds behind developing this tool which requires zero coding and scripts for migrating Office 365 mailboxes to Amazon WorkMail mailbox accounts within a few simple clicks. The tool is rapid and smart in performing the migration task. I wanted to migrate only Office 365 mailbox’s Archive section to WorkMail account, and this made this simple within no time. Thank you, great work guys. Our tool conducts migration from Office 365 to WorkMail. You do not need to adjust your data according to the new platform as the tool take care of the data hierarchy. 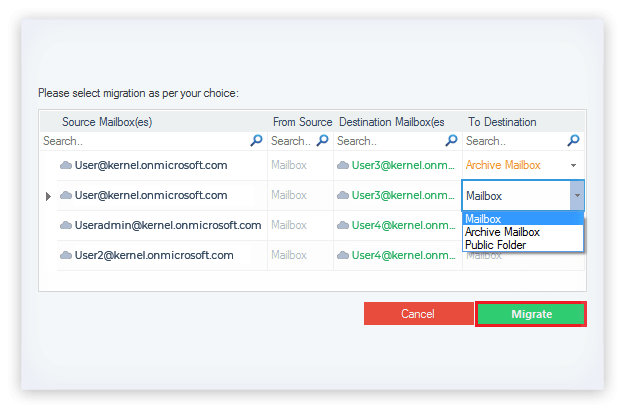 You can migrate mailboxes, archive mailboxes, as well as public folders using our tool. You can migrate an unlimited number of Exchange mailboxes using our tool. Our tool supports migration from both hosted and on-premises Exchange Server (any version). To migrate multiple mailboxes, you need administrative credentials. 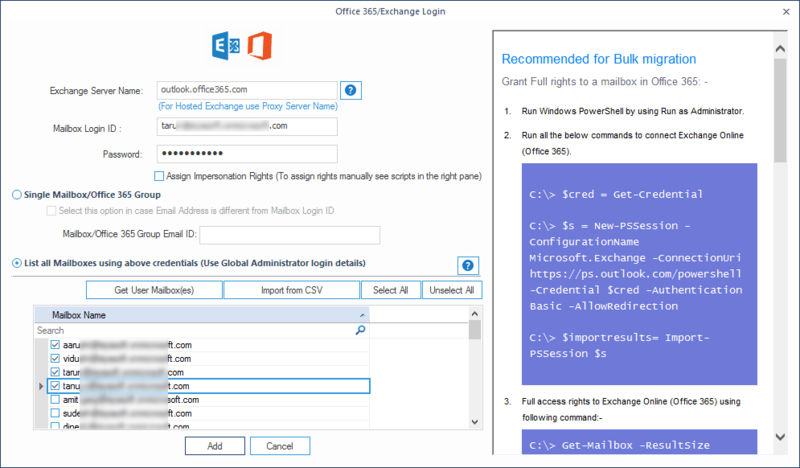 Apart from primary mailboxes, you can migrate archive mailboxes and public folders from Exchange and Office 365. Also, you can migrate data to Amazon WorkMail mailboxes, public folders, and archive mailboxes as per your need. You can map Exchange/Office 365 mailboxes to Amazon WorkMail mailboxes manually or using a CSV file. 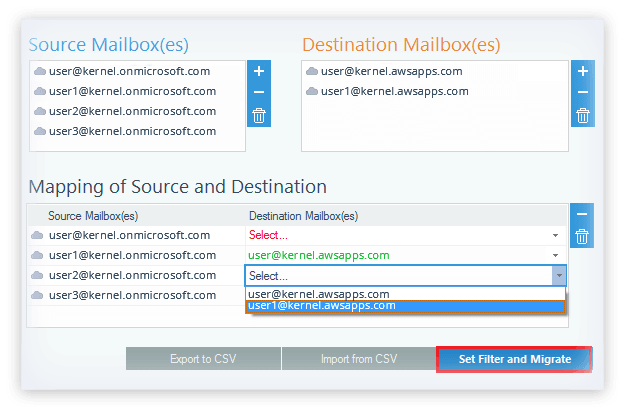 It makes sure you are migrating a source mailbox to the right destination mailbox. Office 365 to Amazon WorkMail tool has a CSV file option for the automatic addition of multiple mailboxes. It provides a pre-designed CSV file in which user can fill the mailbox information and import it to the tool for the automatic addition of mailboxes. You may not require all the Exchange/Office 365 mailbox data in Amazon Work Mail. 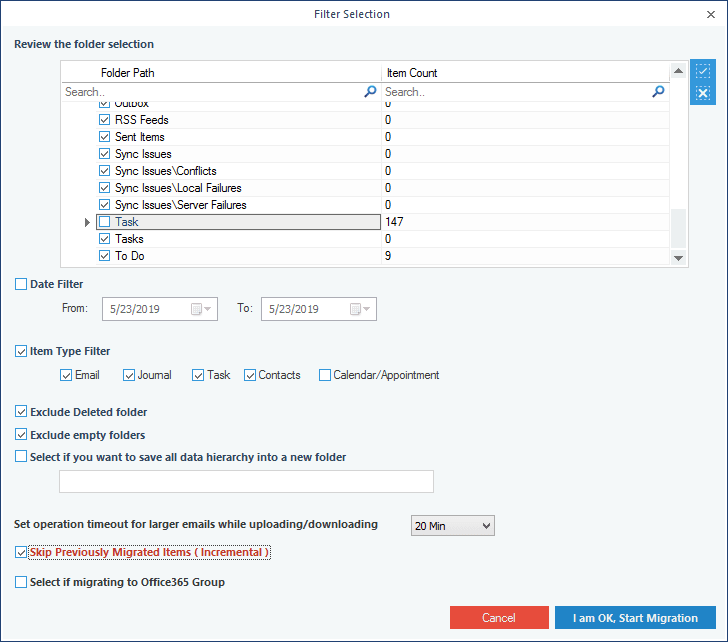 Office 365 to Amazon WorkMail tool provides you filters and selection options to migrate mailbox data selectively. So, you can migrate only the folders/items you need. After every migration, Office 365 to WorkMail tool shows the details of what you have migrated- folder name, its migration status, item count, and error details. You can save the report in a CSV file too. If you want to be familiar with the tool before purchasing it, download the free trial version of the tool. It has all the features of the licensed version, but it can migrate only 10 items per folder. AddAdd source & destination mailboxes and map them. SelectSelect the required options in the source and destination. MigrateApply filters as required and start the migration. 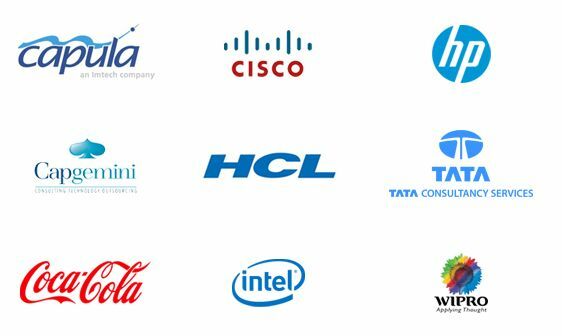 How to migrate Office 365 mailboxes to Amazon WorkMail with this software? 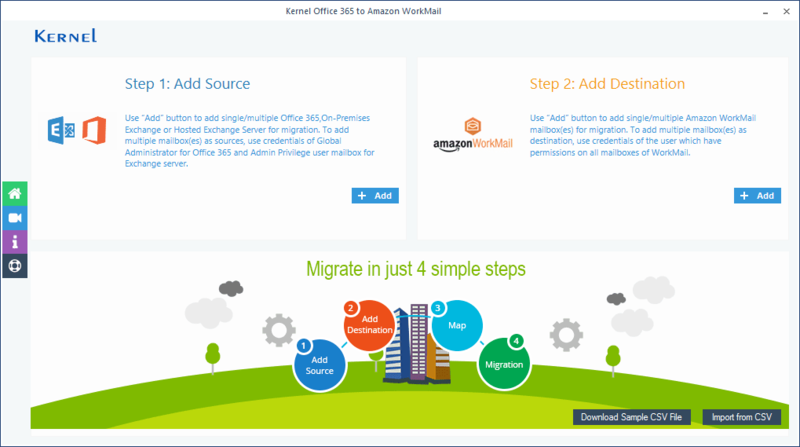 Follow the below steps to migrate Office 365 mailboxes to Amazon WorkMail. Launch the tool on your system and add Office 365 as the source. 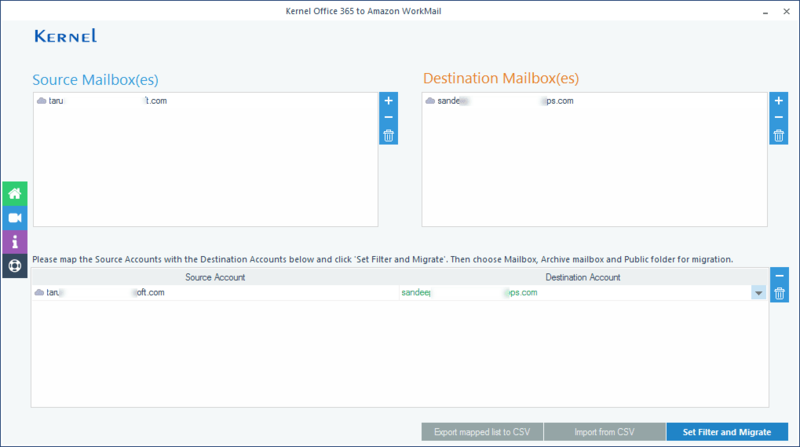 Add Amazon WorkMail account as a destination and click Next. 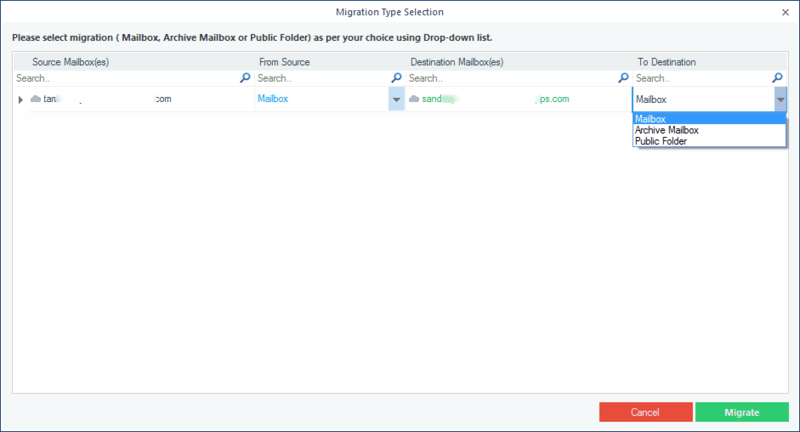 Choose the mailboxes that you want to migrate and click Migrate. Apply the filters to Office 365 mailboxes and click Next. The mailboxes will be migrated to Amazon WorkMail. Can I undo the migration process? NO. After successful migration, you cannot undo the migration. Can a single license work on multiple computers? It depends on the license you have purchased. Kindly see the licensing details on our Buy page. How can I avoid the empty folders from migration? In Filter Selection dialogue box of the tool, there is an option to exclude empty folders. 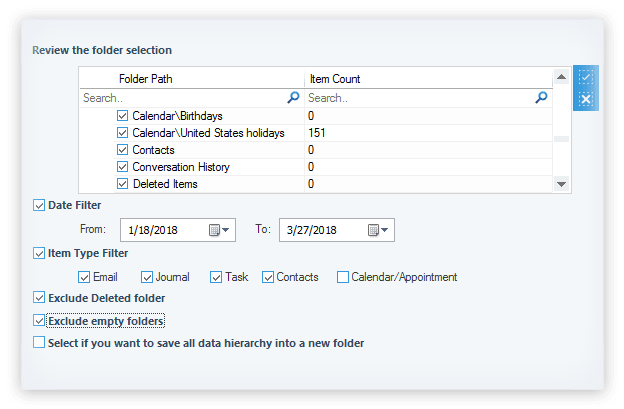 Check this option to skip empty folders at the time of migration. What is the maximum number of the mailbox(es) which a tool can migrate? The tool can migrate many mailbox(es) in a single cycle. So, you can migrate as many mailboxes as you like. Can the tool run several migration processes simultaneously? No. The tool is designed to run only one migration instance at a time. It is a light-weighted tool which focuses on the simplicity of the migration. It does not make it complicated by running multiple instances of migration. Personal LicensePermits home users to use the software on single system. An ultimate solution to fix the corruption issues with no distraction. Best prices available online. Looking forward to make more purchase with exciting offers. What a quality service and positive approach towards customer's problem. I am really impressed. 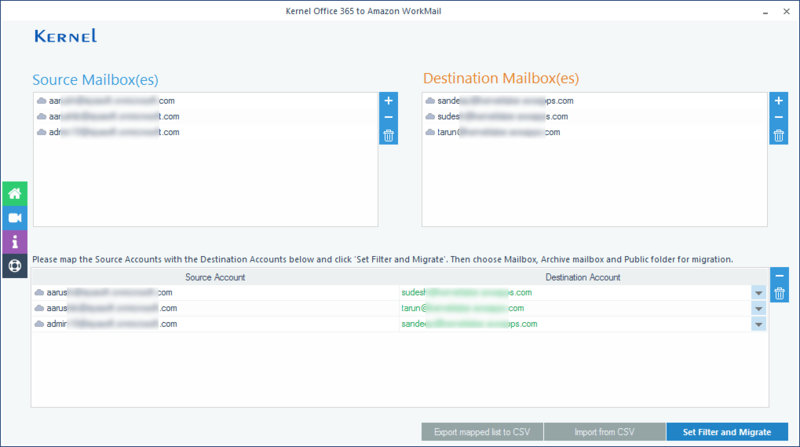 Migrate single mailbox of Office 365/Exchange server to Amazon WorkMail. Map the single source mailbox to single destination mailbox. Select Mailbox, Archive Mailbox, Public Folder from source and destination mailbox. Apply the desired filters like date-range, item-type filter, exclude empty & deleted folder etc. 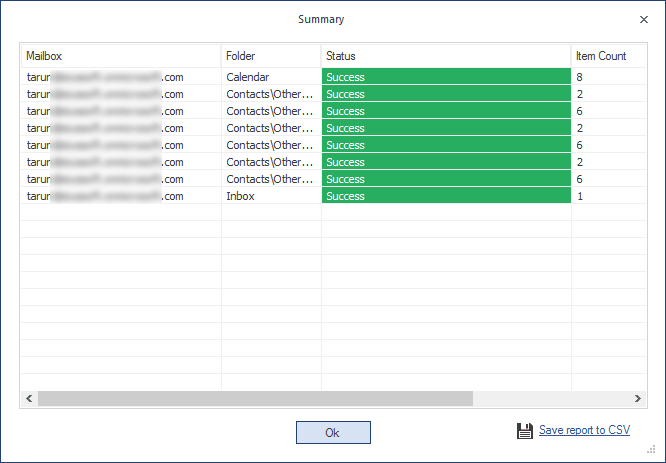 Successful migration from Office 365/Exchange server to Amazon WorkMail. 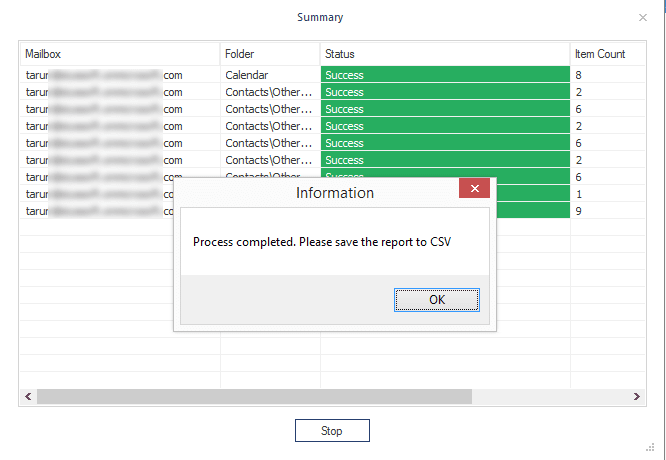 Save full migration report in CSV format. 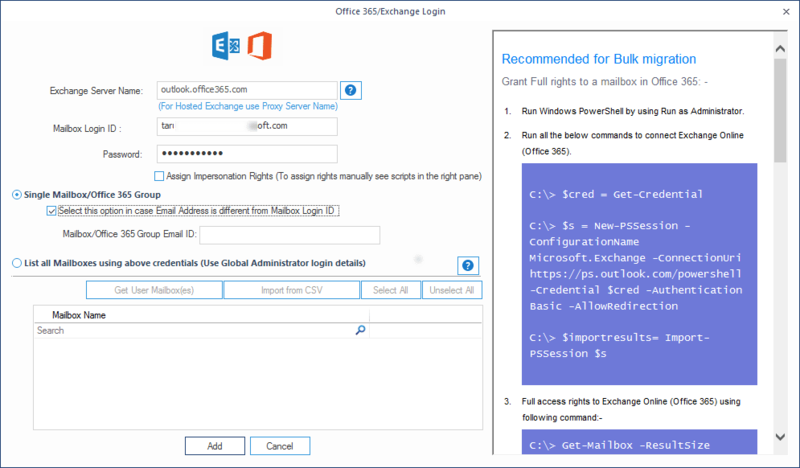 Migrating multiple Office 365/Exchange server mailboxes to Amazon WorkMail. Mapping multiple mailboxes to their desired destination Amazon WorkMail mailbox.